Mix all ingredients except spinach in 5- to 6-quart slow cooker. Cover and cook on Low heat setting 8 to 9 hours or until lentils are tender. Remove ham from cooker; place on cutting board. Pull meat from bones, using 2 forks; discard bones and skin. Stir ham and spinach into soup. Stir well before serving. Pair this thick and meaty soup with a crisp green salad tossed with orange segments and a tangy orange vinaigrette. For a touch of color, stir chopped fresh tomato into the soup with the cooked ham and spinach in step 3. Lentils come in many colors-brown, red and yellow. 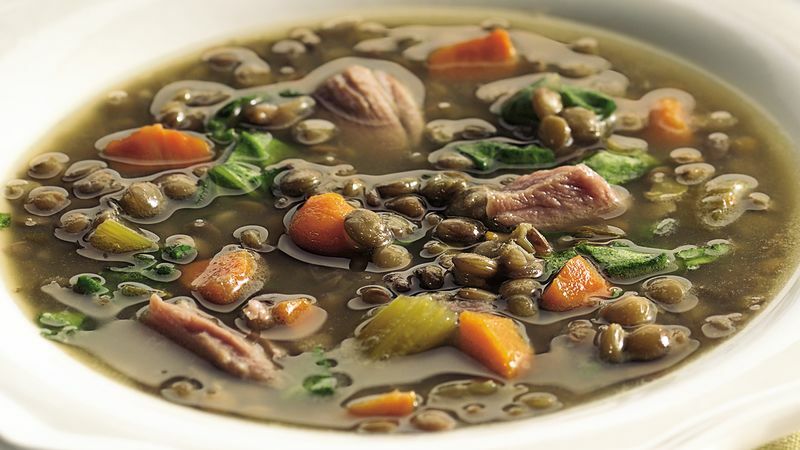 The most common variety is brown lentils, which you will find in most supermarkets.